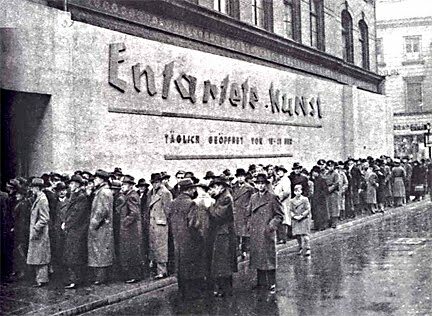 In 1937 in Munich the Nazis held an art exhibition of what they called Entartete Kunst, or Degenerate Art. 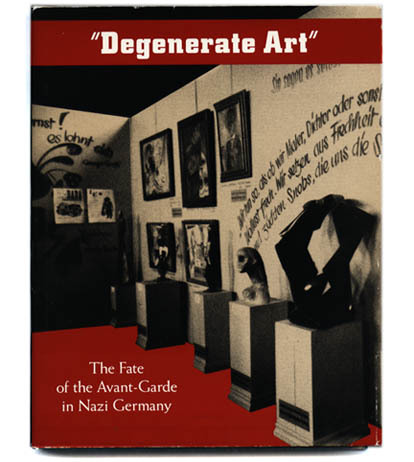 The purpose of the exhibition was to let the Germans know that some forms and pieces of art were not accepted by the "highest race", and this art is "degenerate", also called as Jewish or Bolshevistic. During the "Entartete Kunst" campaign over 20 thousand works by more than 200 artists of that time were confiscated. The grounds for choosing the "unworthy" pieces of art were quite simple and cruel: anything that was out of tune with Hitler's way of thinking, was considered to be "degenerate". Hitler believed the art must serve the purpose of exaltation of the Aryan way of life. In this case, with this great aim, art is perfect and eternal. To Hitler's mind. The authors of the banned works, mostly expressionists, were proclaimed mad. It would be curious to learn that most of those artists are known as the most prominent among their contemporaries, and are still admired. They are: Paul Klee, Wassily Kandinsky, Edvard Munch, many others, and the most degenerate artist of the world, Pablo Picasso. 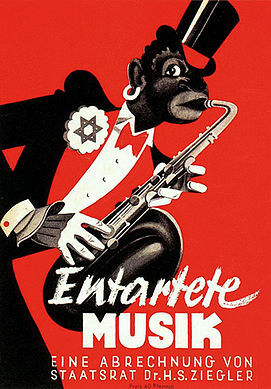 The poster of the "degenerated music" (Entartete Musik) exhibition (1938). This exhibition gave start to a series of art events in Germany of that time, and occurred to be a very powerful way of leading the overall opinion. The Nazis were good psychologists: instead of simply destroying the art works they thought inappropriate, they chose to do it publicly, in order not to create martyrs, so dearly loved by the people. In the way they did it, it worked, and the art of 1930s was labeled by the contemporaries as "incomprehensible and elitist".